Rekenthaler: "So much for the bond bubble"
...the concern about the bond bubble came from investment professionals, most of whom were wrong. To me, a much more salient point was, "supposing there is a 'bond bubble,' do I even need to care about it? How big is it and how bad would it be for me if it collapsed?" The answer I keep coming up with personally is, "1993 surely was a bond bubble, and when it burst, Total Bond didn't even fall -5%." In Rekenthaler's illustration, if we suppose that the yield had gone instantly from 2.5% back to 3.8%, bursting the supposed bubble, that would have been a 1.3% rise. Currently, in Total Bond, an instant rise of 1.3% would cause a decline of 1.3%/year x -6.1 years = -8%. 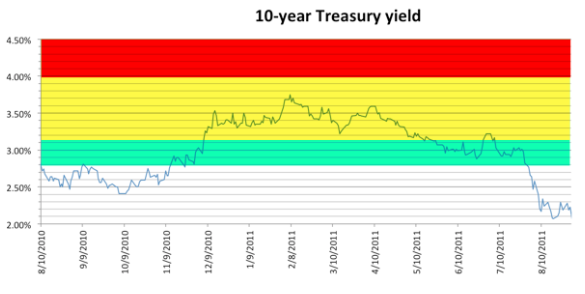 At a current SEC yield of 3%, that would mean less than three years to get back to even. Unpleasant, but nothing to stress about. I imagine such an event might have macroeconomic repercussions, and might be devastating to elegantly balanced leveraged structures, and business plans of giant corporations. It seems like it would be bad for bond-heavy, highly leveraged "risk parity" portfolios. But the direct personal effect on my own bond investments wouldn't be anything to disturb my own sleep. But, in any case, Rekenthaler says that the "bond bubble," feared by sophisticated investors for their own sophisticated reasons, didn't happen. Re: Rekenthaler: "So much for the bond bubble"
I agree that this is a confusing article. Currently, in Total Bond, an instant rise of 1.3% would cause a decline of 1.3%/year x -6.1 years = -8%. At a current SEC yield of 3%, that would mean less than three years to get back to even. Unpleasant, but nothing to stress about. I agree but the loss isn't just 8%. Compound inflation over 3 years must be added to that. Currently inflation has been 2.9% over the last 12 months. Of course we don't know if future inflation will increase, decrease or remain stable over the next 3 years. If it remains stable, 3 years times 2.9%/yr. means you've actually lost 8.7% in real inflation adjusted dollars over a 3 year time span which is not such a great deal. You have to spend real, not nominal 2018 dollars, for future expenses. Bonds are necessary in a portfolio but in a rising rate/rising inflation environment bonds of significant duration perform poorly in real terms. There is no way around that. You get even in real terms after inflation and interest rates stop rising, often years later. 1940 to 1980 produced 4 decades of significantly negative real returns for intermediate term bonds. 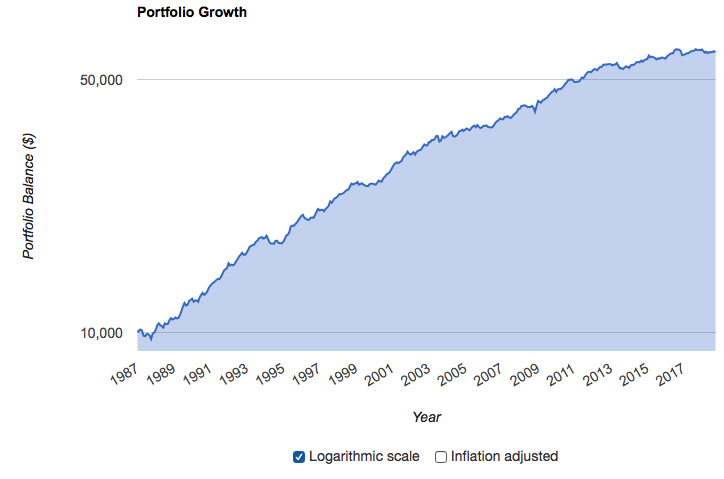 Bonds reduce portfolio volatility but that does not always equate to achievement of investment goals. Current yield is actually 3.23% and if it rose by 1.3%, it would then be 3.53%, so actually just a bit over 2 years to get back to even (nominally). Instead of a bubble, it's been more like a bond balloon, one of the mylar ones that very slowly lose helium. I expect that will continue for a while, but that there won't be any bubbles popping. Theory does not match reality. In 1994 Vanguard Total Bond Market had its worst annual decline since its 1986 inception, -2.7%. For those who stayed-the-course, in 1995, one year later, Vanguard Total Bond Market gained +16%. In 1994, the duration of Total Bond was lower than it is now, both because starting rates were higher and average maturities were shorter. Bond pricing is a matter of math more than investment theory. A worst-case scenario for the bond market is not the US in 1994. It is Russia in 1998, Japan in the 1940s, Germany in the 1920s, and many other examples throughout history. 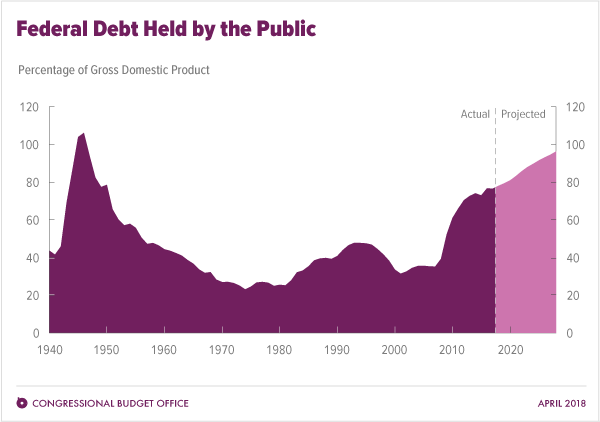 The US is approaching WW2 levels of debt-to-GDP with expansionary fiscal policy at the top of the business cycle. The financial crisis nearly doubled the debt/GDP ratio. I wonder what will happen in the next recession. It seems the post was mostly about the talk in 2010. 2 links at top of article. 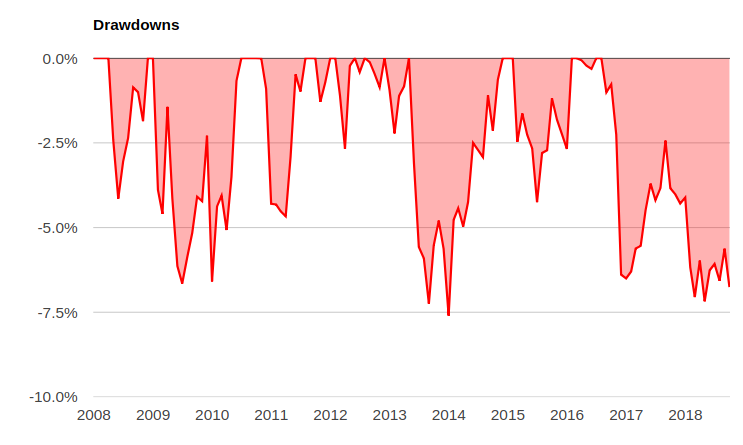 Money continues to pour into bonds at a ferocious pace, with investors confident they are a safe and conservative holding in the midst of all the economic and stock market uncertainty. With last week's further rally, the 30-year Treasury bond had its biggest weekly gain in price since May, pushing their yield down to just 3.66%. The yield on 10-year Treasury notes was pushed down to 2.61%, while the yield on two-year notes fell to 0.496%. The newly found confidence in bonds is in several ways reminiscent of the tech stock bubble in 1999, and the ease with which new issues of tech stocks were being eagerly swept up by investors convinced they could only go higher, finding all kinds of reasons not to believe warnings that they were in a bubble. Certainly. I've posted too many times about "The Great American Bond Bubble," August 25th, 2010, an article by Jeremy Siegel and Jeremy Schwartz, which appeared in The Wall Street Journal. I'll repeat myself below, but the point is that my thinking had been "the bond bubble of 2010 existed and popped, and it wasn't a big deal," while Rekenthaler is saying "there was no bond bubble." That is, I thought there had been a bond bubble because interest rates did rise into the range Siegel and Schwartz warned about, but Rekenthaler is saying that did not constitute the feared bubble. [circa 2000] we experienced the biggest bubble in U.S. stock market history—[a] mania that saw high-flying tech stocks selling at an excess of 100 times earnings. The aftermath was predictable: Most of these highfliers declined 80% or more…. A similar bubble is expanding today that may have far more serious consequences for investors. It is in bonds, particularly U.S. Treasury bonds…. If over the next year, 10-year interest rates, which are now 2.8%, rise to 3.15%, bondholders will suffer a capital loss equal to the current yield. If rates rise to 4% as they did last spring, the capital loss will be more than three times the current yield. Here's what interest rates did; the yellow zone represents "if rates rise to 3.15%, the red zone "if rates rise to 4%." As you see, they got about 2/3rds of the way to that 4%. I say their feared interest rate scenario occurred. Here's what happened to three bond funds. A Treasury fund, blue, which is appropriate because the warning was specifically about Treasuries; an actively managed fund, orange; and an index fund, green. Please note the axis carefully. This barely shows up on ten-year charts. Recovery was helped by the fact that the interest rate fell, but, the fund made back the loss in less than four months, and completed that recovery during the period when interest rates were still high. anguard Total Bond Market Index Fund and the BarCap Aggregate index it tracks lost less than 2%. Many other bond funds would have done about the same. In early 2010, it was reported that Bill Gross, manager of the PIMCO Total Return fund was “frantically dumping Treasuries,” and largely removed them from the fund. This call on Treasuries, which famously backfired in late 2011, helped here; the lowest point was 1.4% down. So, I say feared interest rate scenario occurred--but their feared consequences did not. Something wrong with that graph? At least the World War 2 part looks much too low (I had a number of 180% in my mind; UK was 380% at end of WW2). The thing is the US has a relatively low tax/ GDP ratio compared to other developed countries. There is always room to raise taxes - although it would not be ideal in a recession. For example the USA does not have a VAT tax, but in the early 1990s Japan, Canada and Australia all did so. Thus the USA is the last country in the developed world without a VAT tax (it does have state sales taxes which are kind of sort of the same thing). So in effect public sector debt was substituted for private sector debt. This happens in every financial crisis. It's nice for debt holders in that they suddenly have risk free debt (whether they are forced to take a haircut or not depends; the Irish now concede it was a mistake not to force the bank bondholders to take pain, Iceland went the other direction and it has worked out for them, and they were in a lot worse shape than the Irish in terms of depth of the crisis). Lowering taxes at this point in the business cycle was arguably not so opportune (and I think you are referring to this). But the US is a democracy so this was done with the support of a large part of the political establishment. The stock market liked it, too. I would say that even if their feared consequences had occurred: "If over the next year, 10-year interest rates, which are now 2.8%, rise to 3.15%, bondholders will suffer a capital loss equal to the current yield. If rates rise to 4% as they did last spring, the capital loss will be more than three times the current yield. ", it was ludicrous to compare that to the stock market bubble of 2000 and to claim that the consequences of this predicted loss of about 8% in bonds (which would be earned back in 2 years at the 4% rate) "may have far more serious consequences for investors". I thought so at the time. I didn't write the article. I've never known what they meant by "far more serious consequences for investors;" they didn't explain why an 8% loss in 10-year Treasuries would be "far more serious" than an 80% loss on the NASDAQ or a 50% loss in the whole stock market. I've never been able to reconcile the seemingly potential losses of -5% or so in intermediate-term bond funds with the apocalyptic language. By all accounts, the "bond massacre" of 1994 was serious for somebody, but not for ordinary investors in ordinary intermediate-term, investment-grade bond funds like Total Bond. The only sense I can make of it is that somewhere, out there, other kinds of investors are building delicately calibrate financial chronometers full of gears, levers, and balance wheels, and count on bonds to be the jeweled bearings on which it all turns. When a tiny bit of grit gets in, they stop and the ship gets wrecked. I guess. I don't know. Last edited by nisiprius on Sun Sep 30, 2018 10:26 am, edited 1 time in total. Garland, you knocked this one right out of the park. I remember reading somewhere that bonds lost about 1/2 their purchasing power during the 1946-1982 period. May not have the time period exact but I am thinking about comments that Dr. Bill Bernstein made. We got spoiled by the 1983-2013 bond bull market, probably the greatest in US history. This was a time of both falling inflation and falling interest rates. Now we are seeing the opposite but so far both inflation and interest rates are ticking up, not seeing dramatic increases in either. My belief is that the great bond bull market ended in 2013 with the so-called taper tantrum. You are sounding like me, reminding people that it is purchasing power and not nominal dollars that are important. Even "low" 2% annual inflation eats away 22% of your purchasing power over a decade. Oh, if only there were some kind of bond, a low-risk Treasury bond, that didn't have inflation risk... some kind of, you could call it an inflation-protected security. I know what you will say: "Dreamer! Get your head out of the clouds!" But a fellow can dream, can't he? 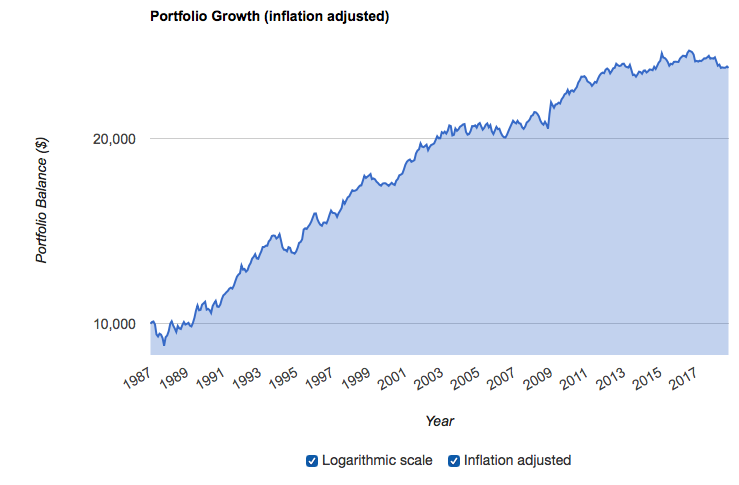 PortfolioVisualizer will adjust a chart (but not, alas, the calculated numbers) for inflation. Here's Total Bond, adjusted for inflation. Here is how it looks in nominal dollars. Last edited by nisiprius on Sun Sep 30, 2018 10:38 am, edited 2 times in total. I've never been able to reconcile the seemingly potential losses of -5% or so in intermediate-term bond funds with the apocalyptic language. Yes, if they had been talking 20-30 year bonds, it would make some sense, but they specifically cited the 10 year. Here's 20-30 year treasuries (TLT) vs. 7-10 year (IEF) vs. bond index. IEF did have about an 8% decline in 2010-2011 and TLT about double that. Wow, Nisiprius, the "bond bubble" burst and the results look utterly catastrophic. I can't find that, how do you make it adjust for inflation?